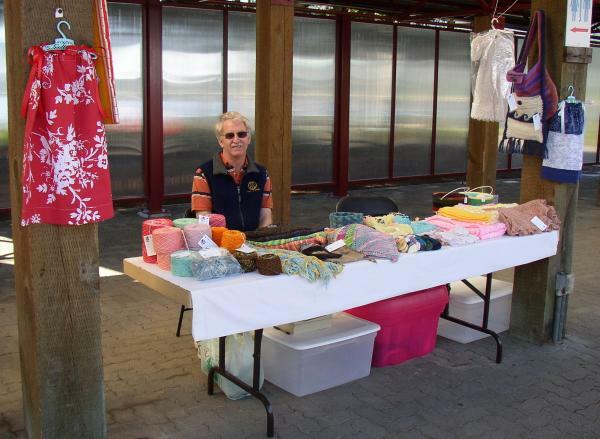 Port Alberni began holding a Craft Market in 2011. When I heard about it I thought it would be the perfect opportunity for me to get rid of the contents of three tote boxes. A lot of it was baby items and I had been told by my children that there would be no more grandchildren forthcoming. It was only $10.00 per Sunday and if I didn't feel like going I didn't have to. I had one table available which we set up under a covered walkway. On cooler days it was downright frigid as the walkway turned into a wind tunnel. I covered my table with an old tablecloth which was totally inadequate for the size of the table. A good day at the market meant I had sold at least $10.00 worth of merchandise and broke even. There were plenty of days when I sold nothing. 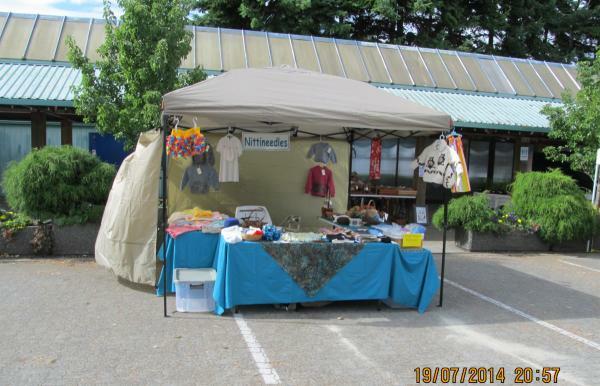 I persevered and this year, Port Alberni Craft Market's forth year in operation, things have changed a little. I now have a shelter with walls to protect me from the sun and rain, three tables on which I display my wares, professionally made signage, generous, appealing table coverings, a custom made business card holder and a large plastic woven mat so I'm not stepping in oil or pine needles. Business is booming and I am having the time of my life. PS: I thought I was all set until I saw the last photo. Now I'm thinking I need a small clothing rack to display all the sweaters and dresses hanging from the roof. Hopefully that customer doesn't come back. Keep your fingers, toes and eyes crossed. Today the craft market - tomorrow the stock market! I think you might be well rid of the woman with the escalating wish list for her custom pullover. Even if she found yarn for you to use, she would probably second guess everything about it once it was done. You should get at least half of your fee when you begin the work and the rest on completion. I learned my lesson the hard way. I don't even buy the yarn until I have a deposit in my hot little hand. Around here they say that craft items can never recover the time and money spent making them. I worked some local events when my ex was selling photography. Printed t-shirts sold well, photos? LOL The typical comment one over-hears is "I could do that". I hear a lot of, "I could do that" and even more, "I've done that". If it was all about the time and money, I wouldn't be doing this at all. I LOVE knitting. The icing on the cake is that people like my work and pay for the items they want. I take that money and buy more yarn (quality stuff), spinning wheels, drum carder, super deluxe ball winder exotic fibres to spin and any thing else that catches my eye. Wonderful -- Delighted for your talent and your deserved success! P.S. Do you offer custom knitting to Craft Market browsers? I do. As a matter of fact I'm currently working on a commissioned shawl for a craft market customer. Sometimes it's more trouble than it's worth. Last Sunday a lady saw my Striped Hoody pullover pattern and wanted me to make one in a size 4, even though the pattern only goes up to size 3. I said, "I can do that" (just add a few stitches here and there). Then she said she didn't want a pullover. She wanted a cardigan. I said, "I can do that" (just leave off the kangaroo pouch and make two half fronts instead of one whole). Then she said she wanted it in the exact same colours as the picture on the pattern and I said, "I don't have any of that yarn left. You find some yarn you like and I'll knit the sweater." As I didn't tell her what the yarn requirements were I'm pretty sure I won't be hearing from her again. It's great that the Craft Market is working out and, best of all, you're having a good time. Comparable as $10.00 AUD is $10.08 CAD. I'm so glad to hear that the craft stall is prospering. Each year has been a bit better than the previous. I just might be doing this for some time to come.